Leudelange, July 2013. The La Luxembourgeoise insurance company has set itself a new course with an eye to the future. This is reflected in the design of their new corporate headquarters. The building combines outstanding architecture with a high level of sophistication in terms of sustainability. Designed by architectural firm Atelier d’Architecture et de Design Jim Clemes sa., the new “Lalux” building is certainly striking. 2,500 aluminium louvres installed at varying intervals in alternating shades of gold, brown and bronze lend the building envelope a memorable rhythm. It is this façade of lustrous, vertical elements, whose sinewy elegance evokes the image of ripening corn in a neighbouring field that lends the building its iconic look. Having drawn their initial inspiration from the expansive fields and meadows in the vicinity, the designers wanted to create a permeable building that both embraces nature and reflects its essence. The prize-winning building was designed around five basic structural blocks set upon a recessed glass base. The units on the three upper floors are linked via series of walkways, whose appearance is as light as it is permeable. In addition to optimising the exploitation of natural light throughout the building, the generous use of glass makes for stunning views and internal lines of sight. Accessible interior courtyards of various designs, in conjunction with greenroofs, emphasise the convergence of nature and architecture. Offices for some 350 members of staff are located on the upper floors whilst a bright and generously proportioned foyer on the ground floor provides a welcoming space for customers and employees. A restaurant, canteen, customer offices, training facilities, a conference hall, crèche and fitness studio spread across the ground floor and upper basement level round off the building. The designers’ main focus for the well-lit, open interior spaces was on their haptic qualities. To this end they favoured natural materials such as oak, terrazzo and textured concrete. In addition they made copious use of various derivatives of the new Lalux logo throughout the building, for example on printed films on glass partition walls or in the form of 3D wall cladding. Even the 3D surface moulding of the louvres is derived from the new Lalux logo. The architects collaborated closely with Fielitz GmbH, specialists in lightweight construction elements, based in Ingolstadt, to develop the shape and structure of the vertical elements, using a completely novel production method. Aluminium sheets were thermoformed in three dimensions and embossed with the specially designed pattern. Formed from a single sheet of aluminium, each louvre is hollow and closed on four sides, making them extremely torsion-resistant and durable. Five hundred of them were also perforated to enable internal lighting: in this way the illuminated blades lend the façade an atmospheric appearance even in the dark. The Lalux building’s façade not only achieves its effect through the three-dimensionality and colour scheme of the vertical elements, but also through the combination of different materials, including glass, anodised aluminium and wood. Working effectively with these materials requires extensive know-how in façade construction, and in the Roding-based specialist, Schindler Fenster + Fassaden GmbH, the architects found a competent partner for the implementation of the building shell. 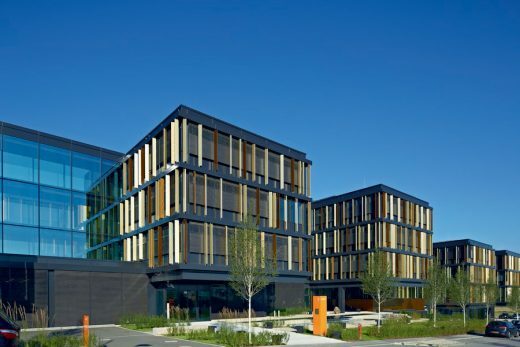 In this new building, with its multi-layered construction extending over more than 15,000 m2, Schindler has combined a mullion-transom structure in oak laminated beams and extensive glazing just as skilfully as with the aluminium elements. In keeping with the overall drive for sustainability, the façade achieves an impressively high Ucw value of 0.85 W/m2K (where cw = curtain wall). Two or three of the aluminium louvres per façade element, each shimmering in a warm metallic glow, forms the upper floor outer layer. Their colour-anodised surfaces, in three shades of gold, are what give the building its warm glow and peculiar chromatic effect. HD Wahl from Jettingen-Scheppach takes the credit for this finish. With their weather and UV-proof coatings, the louvres reflect the light in a myriad of ways. In addition the aluminium blades will retain their natural metallic character for many years thanks to the special Sandalor® anodising process. Achieving a high intrinsic value was one of the client’s primary objectives. This is evident in the way the environment has been managed, the resource-saving construction methods and the sophisticated building services system, which makes optimum use of existing energy sources thereby significantly lowering the building’s heating and energy requirements. The early inclusion of all stakeholders also contributed to the successful construction of this unusual building and the lasting impression it makes.